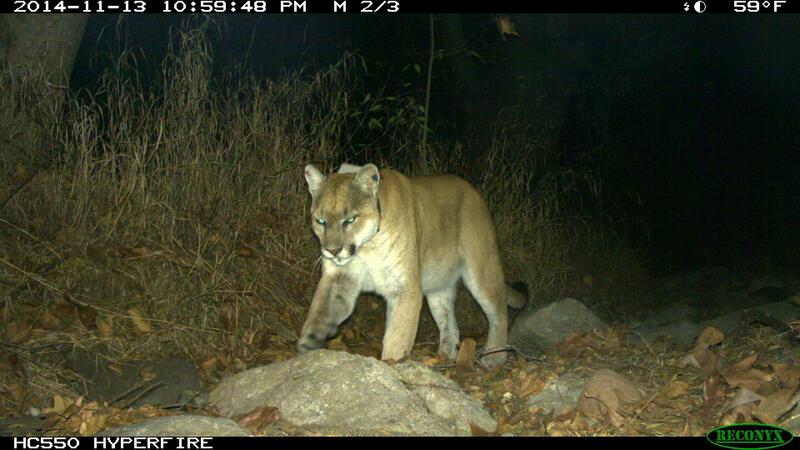 Mountain lion P-22 in Griffith Park: The media hassled cougar in crawl space. 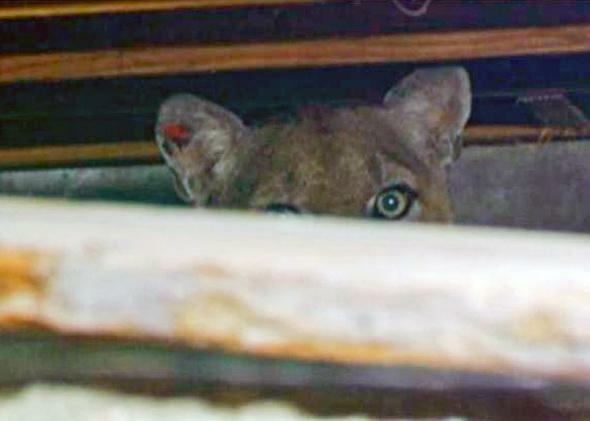 Screen shot of P-22 while he was trapped in a crawl space, surrounded by the media. A male mountain lion lives in Griffith Park, an oasis of semi-natural habitat within Los Angeles. The big cat, dubbed P-22, has gotten a certain amount of fame; he has even graced the cover of National Geographic. Sometime Monday, P-22 decided to go hang out in the crawl space under a house in Los Feliz, a Los Angeles neighborhood bordering the park. The story of P-22 is the story of survival. Griffith Park is surrounded by concrete and swimming pools. The mountain lion somehow managed to cross two of the nation’s busiest freeways—a total of 16 lanes of traffic—to safely land in the park. At least three others have died trying. He has mostly managed to stay away from the prying eyes of people for the three years or so that he’s made the park his home. Then, last March, camera trap photos revealed that he was suffering from mange, likely because he ate a small mammal that had eaten rat poison. Researchers provided medical care, and by May of 2014, new camera trap photos indicated that he seemed to be recovering. Mountain lion P-22 photographed by a camera trap. Now he’s managed to get himself into a sticky situation yet again. The Los Angeles Times reported that Monday afternoon, a pair of workers installing a security system on the house came face to face with a very big cat. They informed the homeowners, who called the city, which then informed the state of California. By mid-day, several reporters were on the scene along with a film crew from NBC. They were there to report on the efforts by the California Department of Fish and Wildlife and Los Angeles Animal Services to coax the cougar out of the crawl space and back into Griffith Park. Once word got out that the animal holed up under the house was indeed the famous mountain lion, more and more news trucks and reporters showed up, all eager to catch a glimpse of the Los Angeles mascot. Helicopters flew overhead. Wildlife officials agreed that all the commotion would make it unlikely for the cat to leave on its own, so they blocked its exit and decided to wait until night fell. Once it became dark, they reopened the entrance to the crawl space. They expected the cat to run into the wooded area adjacent to the house and eventually find his way back to the park. “It’ll be like a fur-covered rocket,” one official told reporters. I know that’s what he said because I could hear it. NBC was livestreaming footage of the scene online, and everything could be heard, including inane commentary from some of the reporters (“Do you think he looks like this emoji?”) on site who seemed not to remember that the cameras were on. And then the news media became part of the story itself. Instead of asking the camera crew and the reporters to move away—or at least to keep their noise down and lights off—the wildlife officials monitoring the situation allowed NBC to keep its cameras rolling and its lights shining, and all the reporters (from NBC and elsewhere) loudly chattering away just outside of the crawl space. Not a pleasant scene for a stressed-out cat. What quickly became apparent was that NBC was running the show. It was as if the entire operation was intended to create compelling television rather than to maximize the welfare of the animal. One strategy to provoke the cat’s exit was to poke it with a long pole—but not before the camera operator could attach a GoPro to it. Then came the tennis ball launcher. (“His ears are perked up but he’s not doing anything.”) And then the beanbag bullets, which were also ineffective. For anyone with a background in wildlife and animal behavior (and based on Twitter and Facebook comments, even for those without), it was clear that the cat was going to stay exactly where it was. I had to wonder whether the wildlife officials were using increasingly aversive methods mainly because sit-and-wait doesn’t make for good TV. In the end, that’s what wildlife officials finally agreed to do, stopping their increasingly futile efforts just short of tranquilizing the cat. “He’s not hurting anyone in there, at some point he’s going to come out,” said homeowner Jason Archinaco. At 9:25 Tuesday morning, the homeowner tweeted confirmation that National Park Service researchers established using radio telemetry that P-22 had left the house, on his own, sometime overnight. Which surprises nobody. Wild animals in big cities already face so many human threats: roads, cars, pollution, habitat loss, climate change. Must we now add the news media to that list? In the best cases, the media can help people connect with nature in a positive way, helping them understand and appreciate it. Monday night, journalists acted as paparazzi, participating instead in the harassment and exploitation of a distressed animal. The California Department of Fish and Wildlife ought to review yesterday’s footage and develop new policies that make ensuring animal welfare their top priority, rather than facilitating cheap entertainment. The better way to see wildlife: through a camera-trap image. Mountain lion P-19, a female, lives in the Santa Monica Mountains.